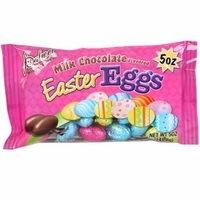 Chocolate Easter Eggs.Milk chocolate flavored Easter eggs in a bright colored foil. Everyone loves chocolate eggs. Place them in your Easter baskets, candy dish or your Easter eggs. We also have crispy eggs and cookies and creme. They are the perfect size to just pop one in your mouth. Each bag has approx 20 eggs.